The table below summarises the information already shown in the diagram on the following pages, to ensure the applicable regulations are respected. (1) RISK OF DEATH OR SERIOUS INJURY: Before installing a child seat on the front passenger seat, check that the airbag has been deactivated (please refer to “Child safety: front passenger airbag deactivation and activation” in Section 1). X = Seat not suitable for fitting child seats of this type. 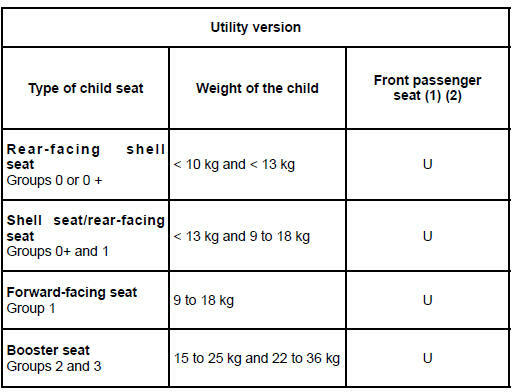 U = Seat which allows a child seat with “Universal” approval to be installed using a seat belt; check that it can be fitted. (2) Raise the seat to the maximum and position it as far back as possible, tilting the seatback slightly (approximately 25°). (3) A carrycot can be installed across the vehicle and will take up at least two seats. Position the child with his or her feet nearest the door. (4) Move the front seat as far forward as possible to install a rear-facing child seat, then move back the seat in front as far as it will go, although without allowing it to come into contact with the child seat. (5) Forward-facing child seat; position the seatback of the child seat in contact with the seatback of the vehicle seat. Adjust the headrest, or remove it if necessary. Do not push the seat in front of the child more than halfway back on its runners and do not recline the seatback more than 25°. (6) Make sure that the child seat or the child’s feet do not prevent the front seat from locking correctly. Refer to the information on the “Front seat” in Section 1. 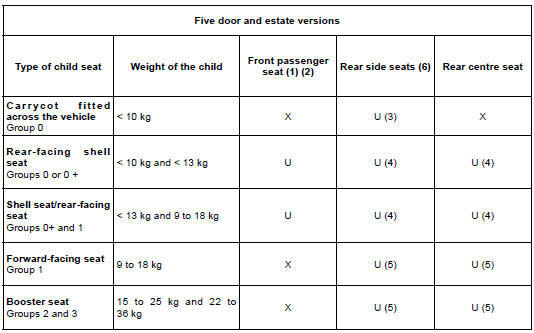 RISK OF DEATH OR SERIOUS INJURY: Before installing a child seat on the front passenger seat, check that the airbag has been deactivated (please refer to “Child safety: front passenger airbag deactivation and activation” in Section 1). Using a child safety system which is not approved for this vehicle will not correctly protect the baby or child. They risk serious or even fatal injury. before fitting a child seat or allowing a passenger to use the seat. with “Universal” approval to be attached by a seat belt. The table below summarises the information already shown on the diagram on the previous page, to ensure the regulations in force are respected.